Visit any river they operate on, and you'll see their equipment is one of the things that sets them apart. I know of no other river company that goes to such lengths to ensure that the gear they use is appropriate for it's application." Good equipment is important, especially when your safety and enjoyment is at stake. Our AVON rafts are a good example. AVON of England is recognized as the world's premier manufacturer of inflatable boats. These rafts cost more, but their performance and durability are unmatched. Most outfitters purchase cheaper rafts and use a "one boat fits all" approach to save money. This limits the ability to match raft to flow and give the highest quality experience possible. Our fleet of over 90 AVON rafts gives us flexibility for every trip. 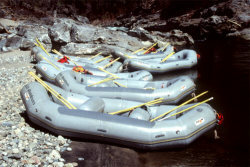 Different rivers, fluctuating water levels and changing conditions require different types of rafts. Our "mixed fleet" allows us flexibility in matching the raft size to the river flow at the time of your trip, ensuring the most enjoyable river experience. Rivers are very special and we want you to have the best time possible when experiencing them...purchasing and maintaining a fleet of AVON rafts of varying sizes allows us to accomplish this on your behalf. Design Features: engineered specifically for technical boulder-slalom style rafting, this performance boat is equally suited to "rodeo" surfing manuevers. Design Features: tried and true, this classic is the flagship of the Avon fleet. An excellent all-around boat for a wide range of flows. Design Features: slightly longer than the explorer, this boat performs well on technical rivers, but can accomodate slightly larger groups. Design Features: built with a flexible floor, these boats bend and bounce with every ripple in the river. A larger capacity provides ample room for larger groups. Paddle Raft and Oar-Paddle Combination options are available on some rivers. In both types of raft each participant is given a paddle. On the paddle raft each person paddles in cadence with the guide's commands. On the oar-paddle combination raft, the guide uses oars while passengers assist with paddles. On Class III rivers that normally use paddle rafts, prior arrangements can be made with our office for oar-paddle combination rafts. Use of paddle rafts on Class IV and V rivers is at our discretion, considering specific trip conditions. Carlisle has long been trusted as the industry standard for strong and lightweight paddle performance. You won't want to find yourself up any creek without one. Because your head is the most important piece of equipment you use on the river, All-Outdoors relies on Pro-tec helmets to provide comfortably padded protection for Class IV and V paddling. Our sturdy America's Cup lifejackets offer our guests the highest flotation available, yet are fully adjustable to provide a comforable fit. Due to size restrictions of the life jackets, participants should not have a chest size larger than 52". Please call our office if you have questions regarding the size of anyone in your group. Our wetsuits have been designed with whitewater paddling in mind. Required on some river trips for your safety and comfort, All-Outdoors has wetsuits available for rental on most rivers.